The Stationery Studio was featured by The Giftionary on Star 94 Radio with this product! Exclusive to The Stationery Studio! Set of 50 correspondence cards, size is 6.25" x 4.625". 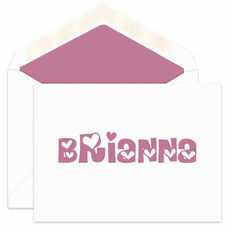 Stock in white or ecru with matching envelopes. You select your favorite raised ink color! Flat printed return address available. Typestyle and positioning only as shown.